Since their arrival in 2010 the team have gone through several guises. Under the watchful eye of their owner Tony Fernandes the team were the 'best of the rest' for the first few years and 2013 can really be seen as a transitional year for the Leafield based team. Continuing their partnerships with Renault (PowerUnits) and Red Bull Technology (Powertrain) can be seen as shrewd move allowing the team more time to concentrate on areas that can bring later performance, chassis design and integration. Having continued to invest in infrastructure the teams move to Leafield last year was done to coincide with the change in technical regulations and to base them closer to the Wind Tunnel they use (One of Williams tunnels in Grove). An all new driver lineup of Kamui Kobayshi and Marcus Ericsson aligns experience with youthful exuberance (although Kamui has the exuberance bit in spades too LOL). see the appendage has been orientated in order to turn flow outward. This is aided by the vertical vane placed just off centre in the Cascade. 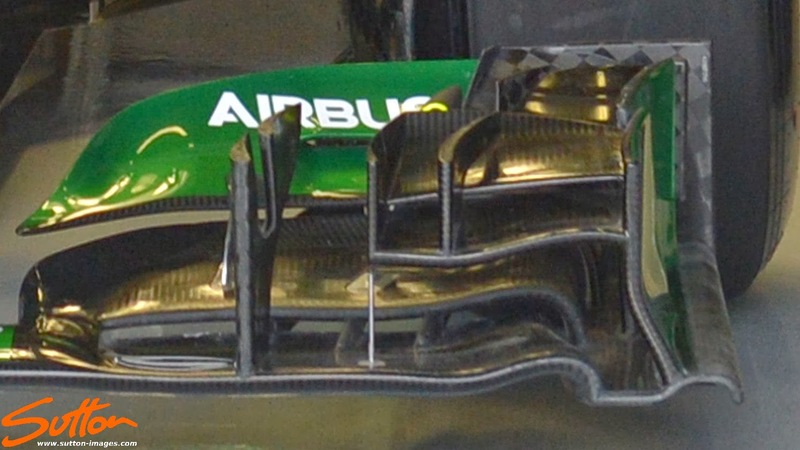 The Wing's Endplates have also been treated to an opening and splaying with the Endplate now split into 2 sections. Mirror, mirror on the wall who is the fairest of them all? Certainly not this one. 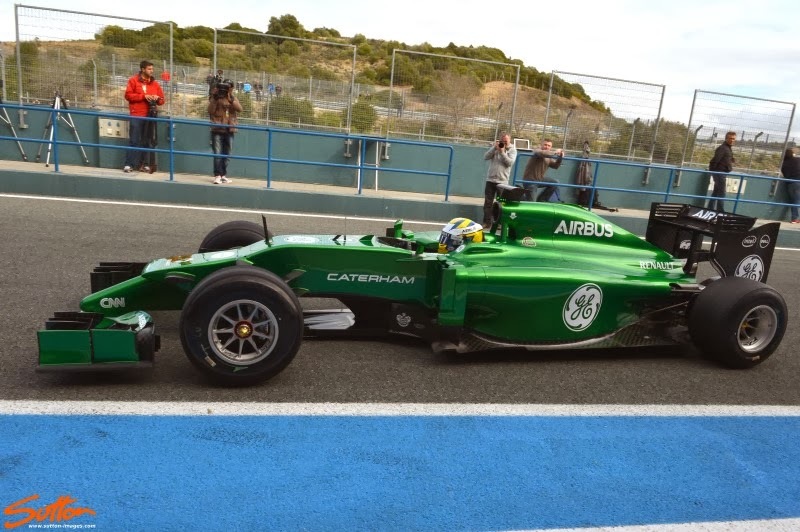 Caterham have taken a rather extreme approach to the nose regulations, hoping that will increase performance downstream. This means that the actual crash structure is made up by another element that sits within the faux panel arrangement. When I initially looked at the Nose regulations I realised there were many ways to skin the cat and so set about drawing out a few of these ideas. 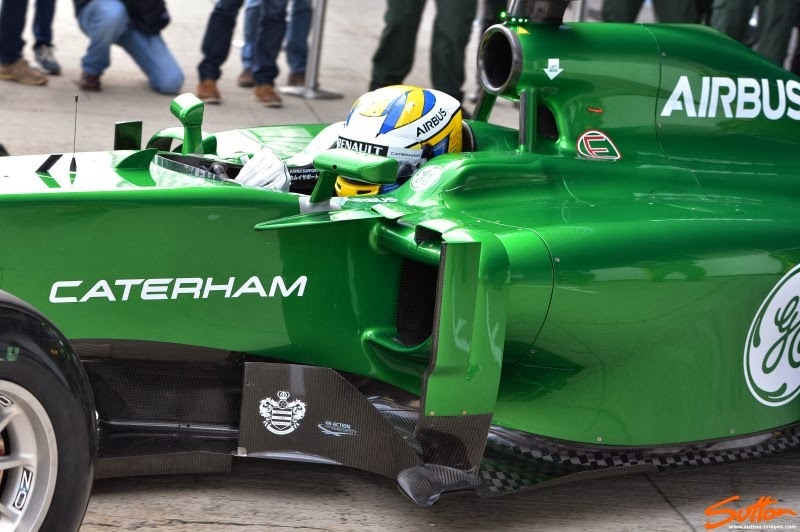 The one used by Caterham is similar to the design I drew out below save the use of the Vanity Panel over the rearward section in order to maximise the airflow underneath the chassis. 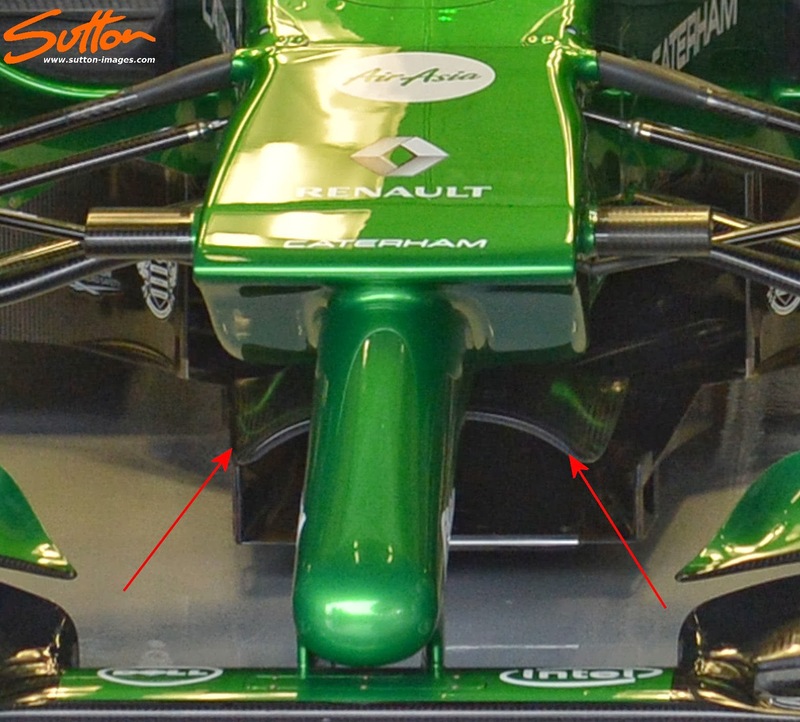 The crooks of any of the designs seen on the cars centres around what can be done with the internal crash structure (lower picture) and as long as it meets with the central point regulations at the tip a vanity panel could and will be used to make up the aero benefits needed by the team elsewhere. 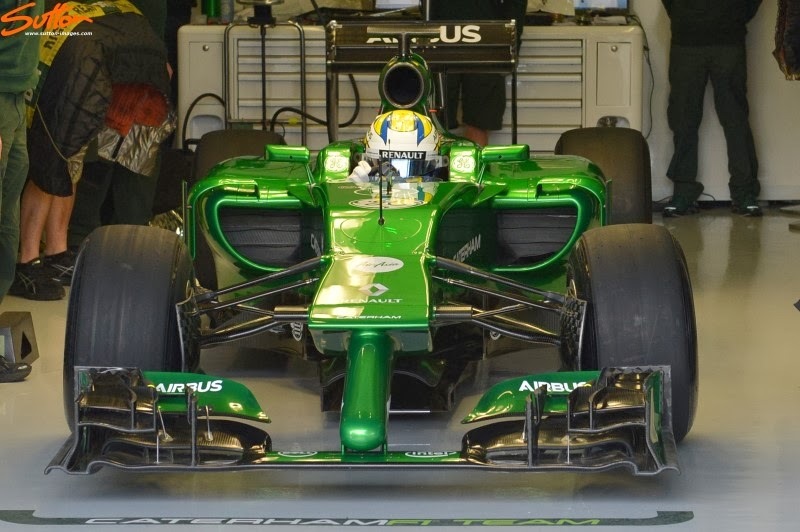 The solution employed by Caterham is very aggressive and although it won't win any beauty awards you have to congratulate the team on their endeavors to push the regulations. The only other question remains is it the best solution? 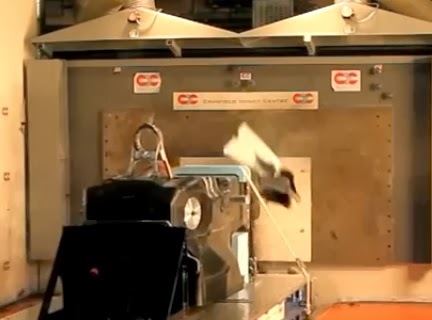 That is something that will need to be assessed on track but the abrubt shaping of the wedge (although it takes the regs to around their limits) is not always the most effiecient way of skinning the cat. For example whilst the likes of Ferrari, Mercedes, McLaren etc pushed the maximum height rules over the last couple of seasons Red Bull did not and were probably around 100mm off the maximum height. time something that Ferrari have been doing for 3 years now. Pull Rod isn't inherently any different from it's Push Rod counterpart in mechanical terms but if implemented correctly can give an aerodynamic advantage. 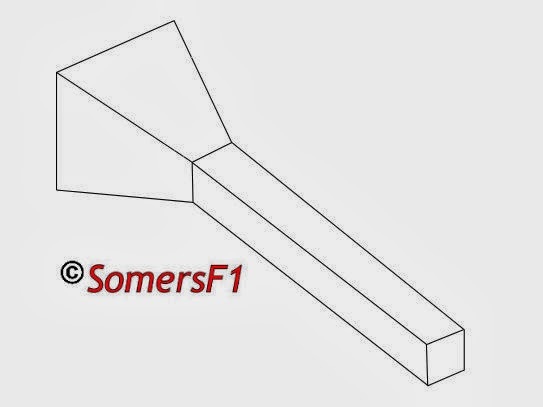 Furthermore the team have implemented a tray underneath the wedge section similar to the 'Snowplough' utilsed by McLaren in 2010 (Coinciding with John Iley's time at the Woking based squad). The Snowplough takes the place of the more vertical Turning Vanes operating in the same way but also taking into consideration the horizontal flow. 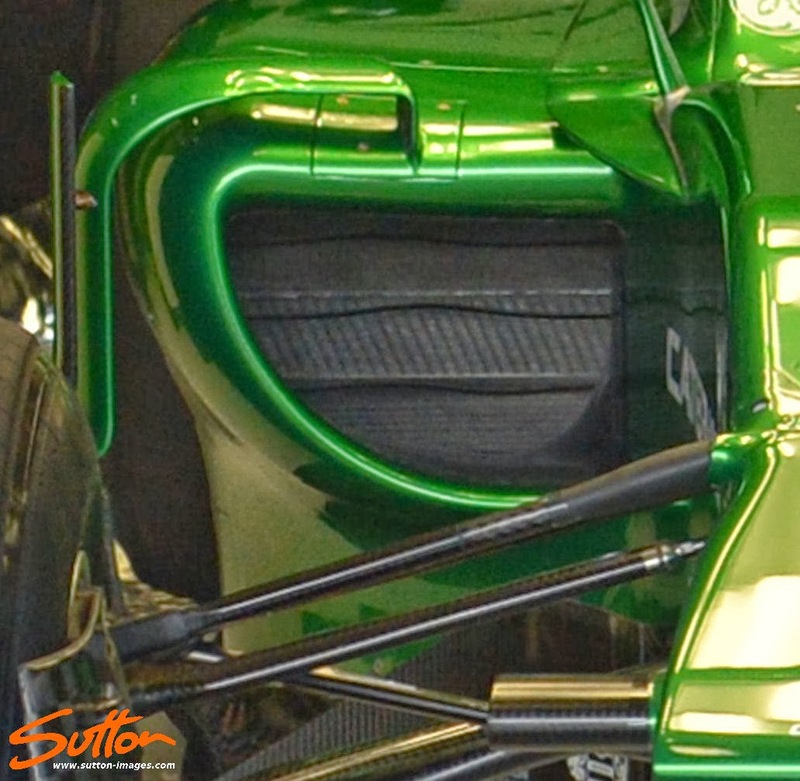 The Sidepod inlet on the CT05 appears to be the largest we have seen thus far and although this will be good in terms of cooling, that drag penalty won't be a side effect the team will relish. Opting to continue with their twin Sidepod Airflow Conditioner that adorned it's predecessor the airflow around and over the Sidepod is framed. Whilst along the side of the Cockpit we find an elongated triangular fin designed to vorticise the airflow combined with another curved fin fitted behind it similar to that run on the Red Bull RB9. The Bagreboard is a carry over from last year and will likely change over the coming weeks to enhance the region. 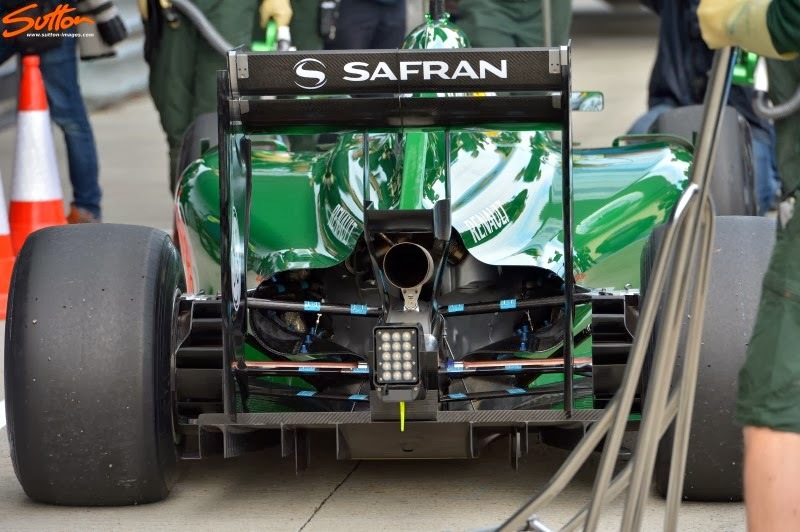 The rear of the Sidepod is treated to a decent undercut with a high waisted cooling exit taking advantage of the onward flow over the suspensions wishbones. The floor ahead of the rear wheel looks fairly straight forward at present and is another area where the team may be able to find gains. Having decided to mount the Rear Wing on 2 centralised pylons the team take advantage of that rigidity with tyre wake slots that run almost the entire leading edge of the Endplates. 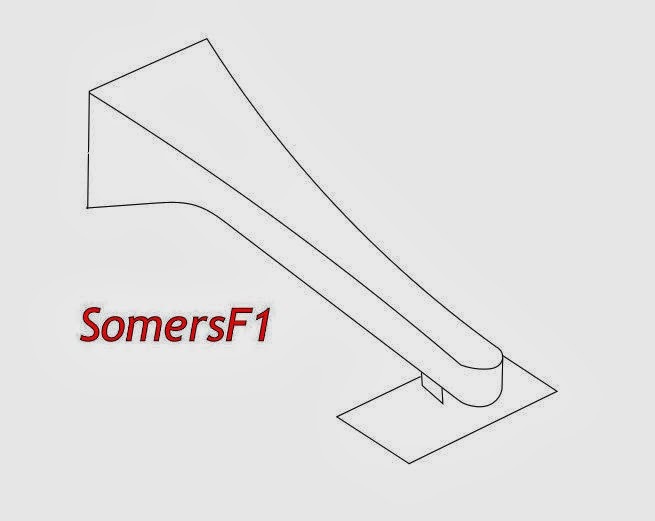 Housed within the structure of the pylons we find a Winglet at the full width of 200mm above the exhaust outlet, placed to maximise the upwash of the exhaust. 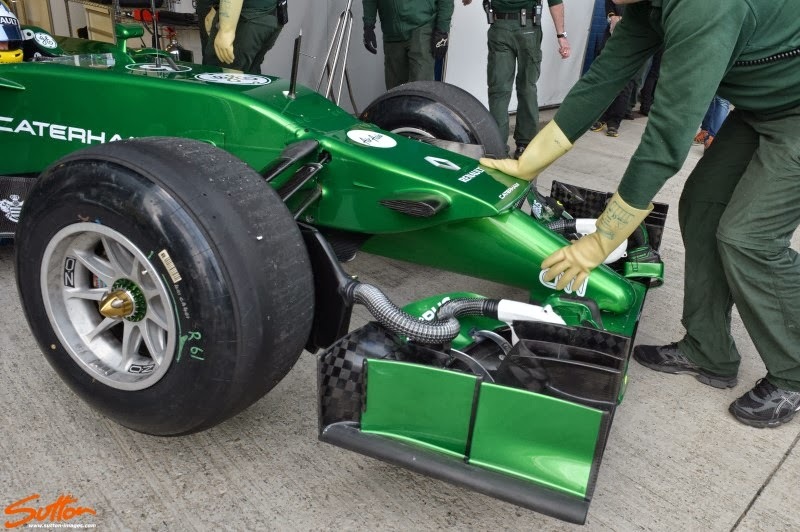 Work has been carried out to the Diffuser with the team opting to use footplates at either end of it this time around. Whilst the team also seem to have spent some time designing their Rear Brake ducts to maximize efficiency. What is most interesting is that although the team purchase their Gearbox from Red Bull Technology they have opted not to run the halfshafts enclosed within the wisbones like Red Bull and Toro Rosso have. Of course this is an early look at the car and I'll update the page as and when more images / information becomes available. Please feel free to ask any questions relating to the car and it's design in the comments section below and I'll try to get back to you in due course. Indeed, I believe they've housed everything within the Endlates like Mercedes did with the WO3.